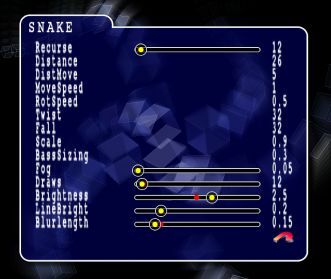 The R2e User Interface starts as a small sidebar that appears when the mouse is moved. A second or so of inactivity of the mouse and it will disappear again. Clicking on the 'R2' circle at the bottom causes the WinAMP control menu to be displayed. Clicking again will make it disappear. From here it will slide out for a few seconds every time the song changes in order to show you the new song name. This allows you to change the options for the currently displayed scene. If there is a scrollbar displayed, you can drag it to a new location. The red dot shows where the default setting is, although at the moment this is often *not* the setting the vis plugin comes with. This will probably eventually be changed. NOTE: The options menu changes options right within the plugin, and there can't be much error-checking otherwise it would slow down. Certain combinations of settings could well crash the scene or make it behave strangely. If you find any options that have the ranges set wrong, please report them and I'll see what I can do. More will come soon, I'm just writing stuff as I get time. If you want to write an article, tutorial for something, get in touch. If its a really useful addition, I may well give out registrations.